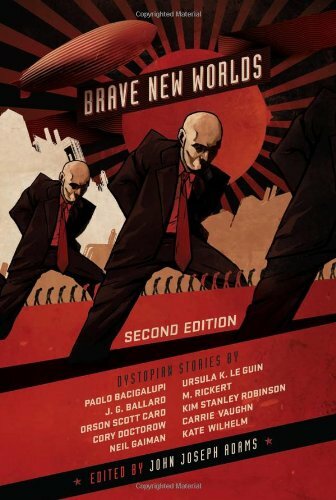 Brave New Worlds collects the best tales of totalitarian menace by some of today’s most visionary writers, including Neil Gaiman, Paolo Bacigalupi, Orson Scott Card, Kim Stanley Robinson, and Ursula K. Le Guin. What I really loved about this book was that it mixes new and old writers, and brings some fantastic stories from writers I’d never heard of, as well as some of the masters of the genre. There’s also a nice intro for each story, introducing the story and the author, and I found that both interesting and helpful. This is a classic sci-fi short story, and it reminds me of some of Ray Bradbury’s best work: that everyday, early 20th century world, with a dark and chilling twist. It has certainly inspired other writers, and I would even say that The Hunger Games is a story much in the same vein as The Lottery. Another classic science fiction tale, and vintage Le Guin. At first, this story seems utopian rather than dystopian… but of course there is a flaw hidden deep beneath, and deep inside even in this perfect society. Le Guin’s writing is flawless as she builds up a beautiful world, and then rips it open. The ending is open to interpretation, and this is most certainly a story that stayed with me. This short story is set in a future society, heavily regimented and strictly controlled from the top down, where people are classified into different groups and equality isn’t even a dream anymore. The main character is a girl called Clara, who searches for an almost forgotten, and almost lost secret, hidden in a mysterious cave. Clara is a fantastic character: complex and compelling, and Wilhelm shows her writing chops by building a believable, complex world and populating it with such memorable characters, all within the space of a short story. A highly recommended read! Many of the stories in this book are rather on the dark side: it is a collection of dystopian short stories after all. But ‘Amaryllis’ is a bit different. In the story, ‘Amaryllis’ is a fishing boat, and like several other of the stories in this collection, it deals with how a future society might try to control the population by restricting who is allowed to get pregnant. However, this story still has something of a happy glow to it: not a utopia, perhaps, but at least a world that leaves some space for hope and love and compassion. This story is set in a future America where women’s rights have been severely curtailed and restricted. Reproductive freedom is gone, and if you do not obey the rules (or if you did not obey them in the past), the punishment is swift and brutal. The story is told from the perspective of a young girl. Her mother has gone missing, and the reason for her disappearance might be that she once broke the rules and is now being hunted. Rickert puts us inside the girl’s mind, as she tries to deal with what has happened to her mother, and what is happening to many other women around her. Another highly recommended read!